Syracuse’s basketball season has already gone through enough rises and falls to qualify for a ride at Six Flags. The campaign began with high expectations following the run last March, only to look bleak with dispiriting losses to Oregon and UConn in New York City. Fear not! The Orange began clicking back up the incline with a feverish win over #16 Ohio State in the ACC/Big Ten Challenge. A five-game winning streak followed. This of course, were the good times before the crash. SU lost in embarrassing fashion to Old Dominion at the Dome, then watched #14 Buffalo come in and pound them on their home floor as well. An ugly defeat to Georgia Tech reminded us all this would be another frustrating SU hoops season. The roller coaster was only just beginning, however. 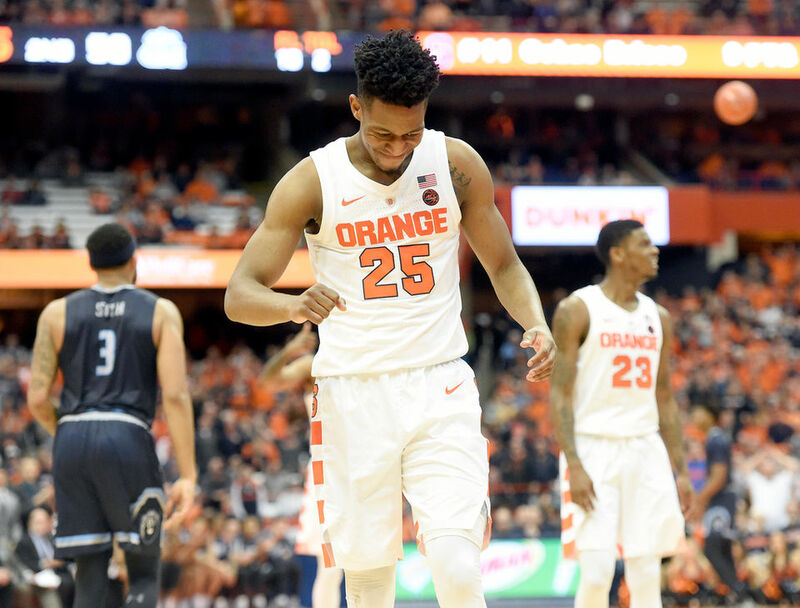 In one of the most surprising wins in program history the Orange went to Cameron Indoor and defeated the top-ranked Blue Devils as 17-point underdogs. Was it a fluke? Maybe not. The Orange then took out Pitt by double-digits, before getting hammered by #10 Virginia Tech. So what gives? Trying to figure out which Syracuse team is the real one is a Fool’s Errand right now. They’ve been an offense that has deep options on some nights. They’ve looked like the grotesque one-man, solo act show on others. They’re good enough to take down the odds on favorites to win the title this year on the road. They’re bad enough to lose at home to Old Dominion. There will never be a clear picture on what this team truly is. This is somewhat perfect. Jim Boeheim has mastered the art of the bubble, meandering through sub-.500 seasons in the ACC, nabbing one of the final spots in the field of 68, then breaking open brackets and marching through to the second weekend and beyond. Vegas still isn’t buying the Orange as top title contenders, though. Right now BetOnline.ag has SU at +5000, alongside unranked Florida State, unranked Wisconsin, #21 NC State, #19 Iowa and #17 Houston. Soon you may even be able to lay some cash legally on the Orange in-state: this is the latest news on NY’s sports betting laws. With more than a month left in the regular season, there’s plenty of time to make noise and announce themselves as the squad that took out Duke in Durham. But if the first three months are any indication, we won’t have a true sense of this team until the music stops.